Pick up your mobile phone and watch your favorite TV show. At home, on your computer, download a feature-length movie in no time at all. If you live in South Korea, it is an everyday reality to have always-on superfast Internet — broadband — both in your cell phone and in your home. South Korea is the most wired country on the planet. Some South Koreans can get up to 20 megabits of data per second — breakneck speed by today's standards. Americans are lucky if they get 4 Mbps. While South Korea leads in the rollout of broadband, the United States —supposedly the world's technology leader — comes in no better than No. 13, according to experts. About 76 percent of households have broadband in South Korea. The figure is 30 percent in the United States. "There is no point in Korea where you can stand without receiving a signal," said Joy King, director of industry marketing at Hewlett-Packard. "In the U.S., we are still at the 'can-you-hear-me-now' level. When Europe and Asia are moving to multimedia text messaging, the U.S. has just started text messages. The U.S. is a Third World country in this aspect." Silicon Valley used to be hailed as the world's high-tech capital. Now many consider South Korea the king. "From my perspective, Silicon Valley does not have that role. The lead is in Asia, in Korea and Japan, no question," King said. South Korea has managed to leapfrog the United States in both broadband and mobile phone usage thanks to a population density that makes connectivity easier and government policies that promote development. South Korea also has a culture where people are crazy about playing online games and don't go home after work. Instead, they go to dinner, to karaoke or to a bar — all the while using their mobile phones. U.S. technology leaders are sounding the alarm that the nation is falling dangerously behind in broad areas of digital innovation, including broadband. Last week, technology executives affiliated with the lobbying group TechNet traveled to Washington to press for government policies that would promote broadband development. The U.S. information superhighway has turned into a "bumpy, two-lane country road" compared with broadband development in other countries, the group said. As Silicon Valley's biggest corporations complain about the relative backward state of broadband in this country, they are rushing to South Korea to see if their products pass muster with some of the world's most demanding technology customers. Silicon Valley companies view South Korea as a sort of time machine when testing broadband applications, a place where they can get a glimpse of what Americans will use in the future. 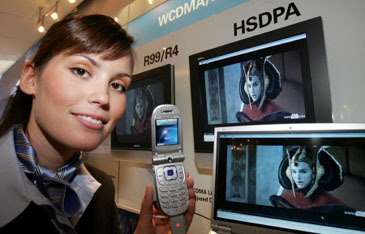 Samsung, the giant South Korean electronics company, tests its new products in Korea first for six to eight months. "It collects feedback from customers (to) remodel and fix things before introducing the products worldwide," said Jong Kap Kim, executive director of South Korea's iPark Silicon Valley. "And several U.S. companies are doing the same." Microsoft brought MSN Mobile, which enables instant messaging on mobile phones, to South Korea two years ago. It introduced the service in the United States six months later. "It's still much more popular in Korea," said Brooke Richardson, MSN lead product manager. "It's not only that the U.S. is not so advanced in broadband. Mobile phone usage is not so high here either. MSN is bridging the two worlds of PCs and mobile phones, and Korea has that connectivity. We have incubated some of our stuff in Korea, like mobile instant messaging and mobile e-mail. We have also launched services there that the rest of the world was not ready for." For example, with MSN Messenger, Koreans use avatars, a cartoon that represents them online. When your friends see your avatar, they know you're online and instant messaging. "Basically, customers in Korea buy a virtual person. For a small fee, they can buy clothes, shoes and purses for it," Richardson said. South Korea's success story began when the country was hit by a financial crisis in 1997 and 1998. "At that time, the Korean government turned to the high-tech industry as a solution to overcome the crisis. Broadband was a new market with new demand for modems, routers, servers, computers, a new infrastructure. It caused a lot of activity and created many jobs," iPark Silicon Valley's Kim said. The South Korean government ensured competition by ending state-owned Korea Telecom's monopoly. The government spent billions of dollars building a fiber grid, reaching schools and government buildings, and offered another billion in financial incentives to phone companies that strung broadband links to homes. Tough competition drove prices down, demand surged and the country was on a roll. South Korea is also a small country where 30 percent of its 48.6 million inhabitants live in the three main cities — and most of them in dense apartment blocks. "It's unbelievable dense," said Ward Hanson, a research fellow at the Stanford Institute for Economic Policy Research who recently returned from a visit to South Korea. "When you drive in to Seoul along the Han River you see thousands of high- rise buildings, 20 to 30 stories high. It's much like Manhattan in New York, but even denser than that." And it is much cheaper and much easier to wire an apartment building than a typically spread-out U.S. city and its suburbs, not to mention the nation's vast rural areas. 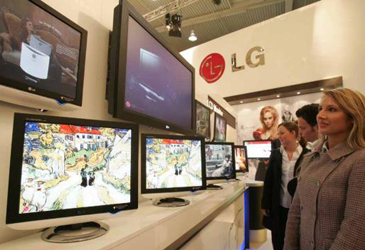 Experts also point to computer games as a crucial catalyst for Korea's explosive broadband growth. "Until very recently, Korea strictly limited impact of Japanese culture, remembering the colonial Japan, and prohibited videos, movies, video games and PlayStations from Japan," Hanson said. "Koreans therefore played PC games and a whole industry with game parlors grew. Now there are more than 100,000. And if you competed with somebody who had broadband, you were killed." President Bush has said all Americans should have access to broadband by 2007. To reach that goal, he has promised to remove bureaucratic obstacles. But, unlike the Korean government, his administration is not pumping money into the market. HP's King cites several reasons for slow broadband development. "North America is lagging because first of all it didn't have one underlying standard, " she said. "Secondly (it's lagging) because the government has not really invested directly in infrastructure. " And, because Americans go home after work, "the lifestyle doesn't create as much demand for certain services," she noted. Hanson said he doubts that the United States will reach its broadband goals by 2007. "In Korea, competition has been a driving force. In the U.S., you often only have one cable company, and the company is not forced to upgrade its speed," he said. "I have had DSL for three years and I have never been approached about an upgrade. In Korea, you can even watch television on DSL. "What we have now is good for print, but multimedia is very challenging. We haven't invested in infrastructure the way other countries have. If you have very high speed, the whole system upgrades around that, you get applications for it, and congestions and bugs get fixed," Hanson said. Right now South Korea is changing over to wireless broadband, Wi-Bro, and it will also have digital multimedia broadcasting. "While I drive my car, I can enjoy my cellular phone that broadcasts over the Internet while I simultaneously have Yahoo map service up," Kim said. "I can just switch between the two. The tests are already done, companies will start selling these applications around midyear." The Korean government has a strategy designed to push the nation into the next generation of broadband applications. It calls for the introduction of eight new services, one of them Wi-Bro, which will require building three networks. That infrastructure, in turn, will pave the way for nine fast-growing technologies, such as digital TV and multimedia broadcasting. The program aims to help raise Korean gross domestic product to $20,000 per capita from $12,600 in 2003, the latest available figure. In the United States, GDP per capita was $40,000 in 2004. One of South Korea's nine new technology sectors is a computerized appliance, called a ubiquitous robotic companion, which you could carry with you to connect to the Internet wherever you are. Whether or not these applications will be popular, it is clear that South Korea has created an environment where technology development is very fast. And the South Koreans are using their domestic market as a stepping stone into the world. 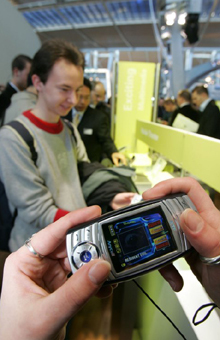 Korea's information technology sector accounted for exports of $75 billion in 2004. South Korean company SK Telecom supports rollouts of wireless broadband services in other Asian countries. "We are also expanding our experience to the U.S.," said SK Telecom Vice President Wonhee Sull, citing a joint venture with Internet service provider EarthLink in Atlanta. While South Korea has focused on consumer products, HP's King said she sees an opportunity for the United States in business tools. The above article is from San Francisco Chronicle.